To schedule a runbook in Azure Automation to start at a specified time, you link it to one or more schedules. A schedule can be configured to either run once or on a reoccurring hourly or daily schedule for runbooks in the Azure portal. You can also schedule them for weekly, monthly, specific days of the week or days of the month, or a particular day of the month. A runbook can be linked to multiple schedules, and a schedule can have multiple runbooks linked to it. Schedules do not currently support Azure Automation DSC configurations. The cmdlets in the following table are used to create and manage schedules with PowerShell in Azure Automation. They ship as part of the Azure PowerShell module. New-AzureRmAutomationSchedule Creates a new schedule. Set-AzureRmAutomationSchedule Sets the properties for an existing schedule. Register-AzureRmAutomationScheduledRunbook Associates a runbook with a schedule. Unregister-AzureRmAutomationScheduledRunbook Dissociates a runbook from a schedule. 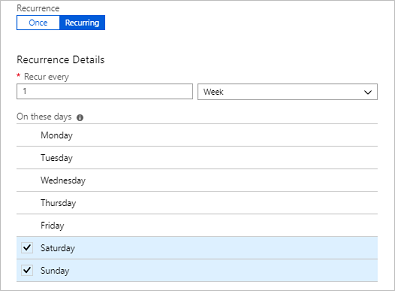 You can create a new schedule for runbooks in the Azure portal or with PowerShell. Azure Automation uses the latest modules in your Automation account when a new scheduled job is run. To avoid impacting your runbooks and the processes they automate, you should first test any runbooks that have linked schedules with an Automation account dedicated for testing. This validates your scheduled runbooks continue to work correctly and if not, you can further troubleshoot and apply any changes required before migrating the updated runbook version to production. Your Automation account does not automatically get any new versions of modules unless you have updated them manually by selecting the Update Azure Modules option from the Modules. In the Azure portal, from your automation account, select Schedules under the section Shared Resources on the left. Click Add a schedule at the top of the page. On the New schedule pane, type a Name and optionally a Description for the new schedule. Select whether the schedule runs one time, or on a reoccurring schedule by selecting Once or Recurring. If you select Once specify a Start time, and then click Create. If you select Recurring, specify a Start time and for Recur every, select the frequency for how often you want the runbook to repeat - by hour, day, week, or by month. If you select week, you're provided a list of the days of the week to choose from. Select as many days as you want. The first run of your schedule will happen on the first day selected after the start time. For example, to choose a weekend schedule, choose Saturday and Sunday. If you select month, you're given different options. 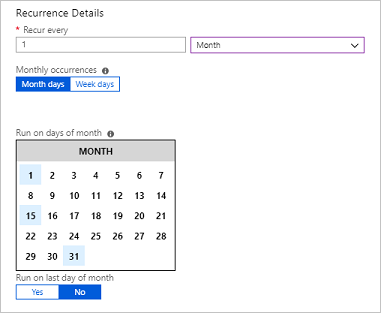 For the Monthly occurrences option, select either Month days or Week days. If you choose Month days, a calendar is shown that allows you to choose as many days as you want. If you choose a date such as the 31st that doesn't occur in the current month, the schedule won't run. If you want the schedule to run on the last day, choose Yes under Run on last day of month. If you choose Week days, the Recur every option is presented. Choose First, Second, Third, Fourth, or Last. Finally choose a day to repeat on. You use the New-AzureRmAutomationSchedule cmdlet to create schedules. You specify the start time for the schedule and the frequency it should run. The following examples show how to create many different schedule scenarios. The following sample commands create a one time schedule. The following sample commands show how to create a recurring schedule that runs every day at 1:00PM for a year. New-AzureRmAutomationSchedule -AutomationAccountName "ContosoAutomation" -Name "Schedule02" -StartTime $StartTime -ExpiryTime $EndTime -DayInterval 1 -ResourceGroupName "ResourceGroup01"
The following sample commands show how to create a weekly schedule that runs on weekdays only. New-AzureRmAutomationSchedule -AutomationAccountName "ContosoAutomation" -Name "Schedule03" -StartTime $StartTime -WeekInterval 1 -DaysOfWeek $WeekDays -ResourceGroupName "ResourceGroup01"
The following sample commands show how to create a weekly schedule that runs on weekends only. New-AzureRmAutomationSchedule -AutomationAccountName "ContosoAutomation" -Name "Weekends 6PM" -StartTime $StartTime -WeekInterval 1 -DaysOfWeek $WeekendDays -ResourceGroupName "ResourceGroup01"
The following sample commands show how to create a recurring schedule that runs on the 1st, 15th, and last day of a month. A runbook can be linked to multiple schedules, and a schedule can have multiple runbooks linked to it. If a runbook has parameters, then you can provide values for them. You must provide values for any mandatory parameters and may provide values for any optional parameters. These values are used each time the runbook is started by this schedule. You can attach the same runbook to another schedule and specify different parameter values. In the Azure portal, from your automation account, select Runbooks under the section Process Automation on the left. Click on the name of the runbook to schedule. If the runbook isn't currently linked to a schedule, then you're offered the option to create a new schedule or link to an existing schedule. If the runbook has parameters, you can select the option Modify run settings (Default:Azure) and the Parameters pane is presented where you can enter the information. You can use the Register-AzureRmAutomationScheduledRunbook cmdlet to link a schedule. You can specify values for the runbook’s parameters with the Parameters parameter. For more information on specifying parameter values, see Starting a Runbook in Azure Automation. The following sample commands show how to link a schedule to a runbook using an Azure Resource Manager cmdlet with parameters. Create a webhook for the runbook and use Azure Scheduler to call the webhook. Azure Scheduler provides more fine-grained granularity when defining a schedule. Create four schedules all starting within 15 minutes of each other running once every hour. This scenario allows the runbook to run every 15 minutes with the different schedules. When you disable a schedule, any runbook linked to it no longer runs on that schedule. You can manually disable a schedule or set an expiration time for schedules with a frequency when you create them. Once the expiration time is reached, the schedule is disabled. Click the name of a schedule to open the details pane. If you want to disable a schedule that has a start time in the past, you must change the start date to a time in the future before saving it. You can use the Set-AzureRmAutomationSchedule cmdlet to change the properties of an existing schedule. To disable the schedule, specify false for the IsEnabled parameter. The following sample commands show how to disable a schedule for a runbook using an Azure Resource Manager cmdlet. –Name $scheduleName –IsEnabled $false -ResourceGroupName "ResourceGroup01"